37 Salad Recipes That Will Help You Smash Your Weight Loss Goals! When most people think of healthy eating, they think of salads. When they think of salads, they think of boring, wet lettuce, cucumber and boiled chicken, but nothing could be further from the truth. When it comes to dieting, salads can be your best and most delicious secret weapon. Generally, low in calories, high in protein, delicious and customisable, they can be an everyday staple in your diet. However, don’t underestimate the calories that a salad can pack in! While lettuce has virtually no calories, sometimes the dressings and toppings can really add up! 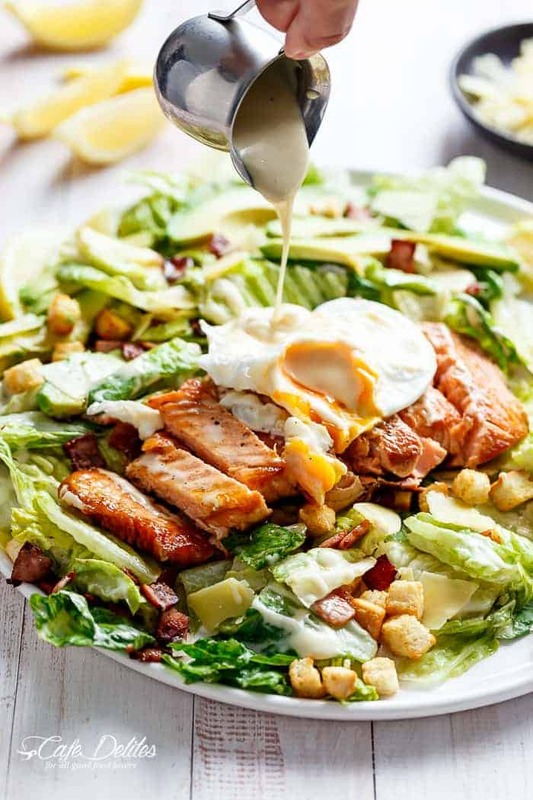 Here, we have collected 37 incredible, delicious, weight loss salads from some amazing food blogs that will get you dropping pounds in no time! As always save and share your favourites and get started today! “I love this salad for many reasons. It’s super easy to whip up, healthy and packed with flavor. I love the homemade caesar dressing that comes with this recipe.” Recipe: LifeInTheLoftHouse. “This Grilled Lemon Herb Mediterranean Chicken Salad recipe is as closest to perfect as you can get! Full of Mediterranean flavours: olives, tomatoes, cucumber, avocados, and chicken for a complete meal in a salad bowl!” Recipe: CafeDelites. 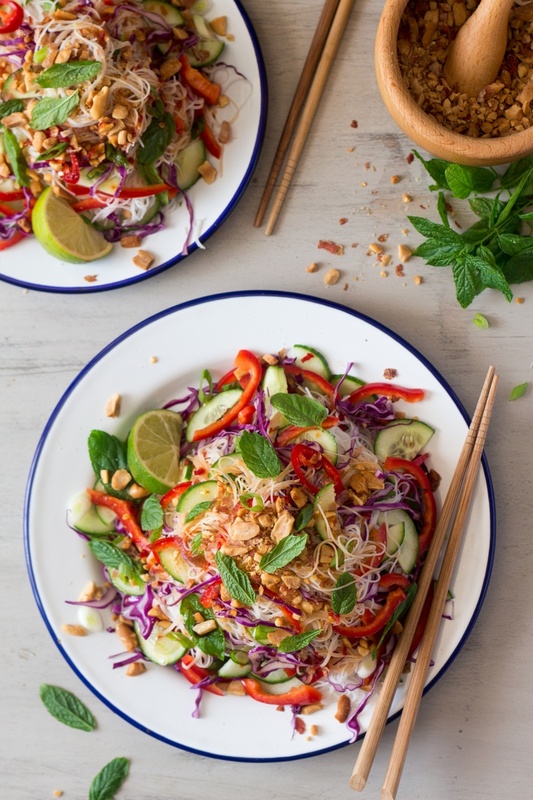 “This Asian vermicelli salad with crushed peanuts is pretty much what we’ve been living on for the entire summer. As its still pretty hot here (so much so that I’m planning to top up my tan on Saturday, yay! ), I’m not about to stop making it just yet so I thought I would share this simple recipe with you. It’s easy and quick to make and really flexible.” Recipe: LazyCatKitchen. “I think it’s safe to say this is my favorite salad ever. It is beyond delicious. The flavors and textures were just meant to be. 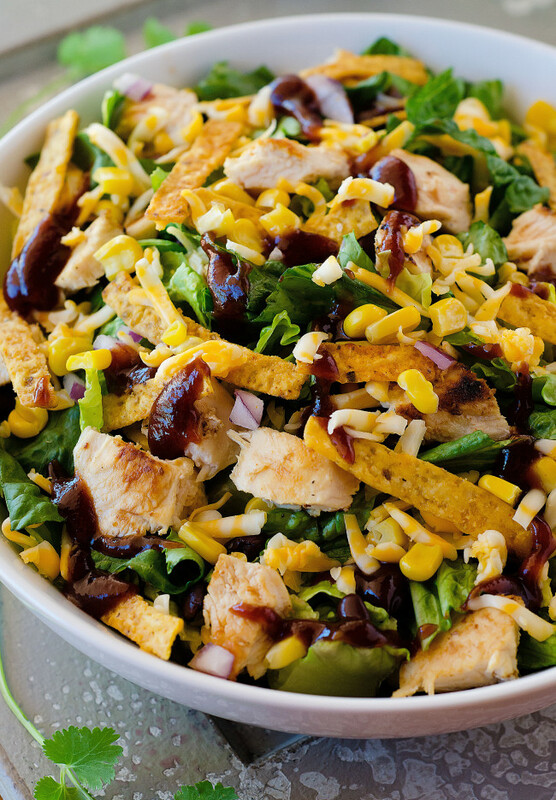 Grilled chicken, barbecue sauce, black beans, corn and crunchy tortilla strips… Oh, and lettuce. Don’t forget the lettuce. This is a salad after all and it’s a party on a plate.” Recipe: LifeInTheLoftHouse. “Oh it’s so good. 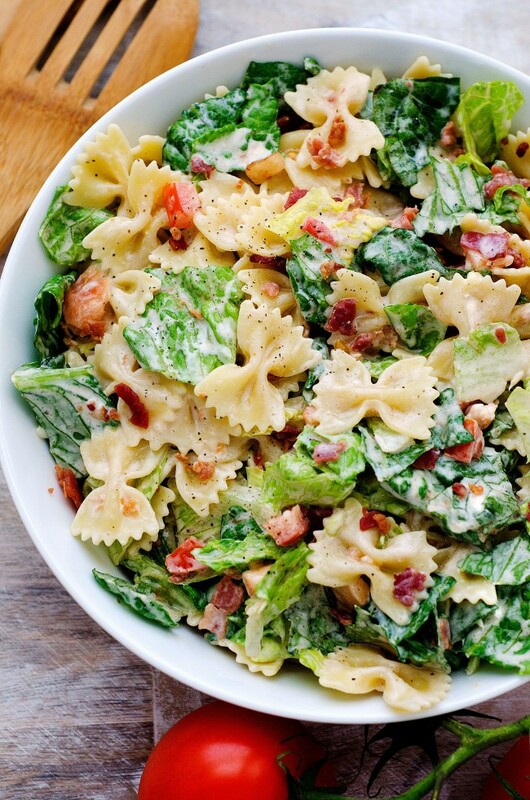 It’s like a BLT sandwich, without the bread, broken down into one heck of a pasta salad. The original recipe calls for mayo. You all know I despise mayo, so I replaced it with ranch dressing.” Recipe: LifeInTheLoftHouse. 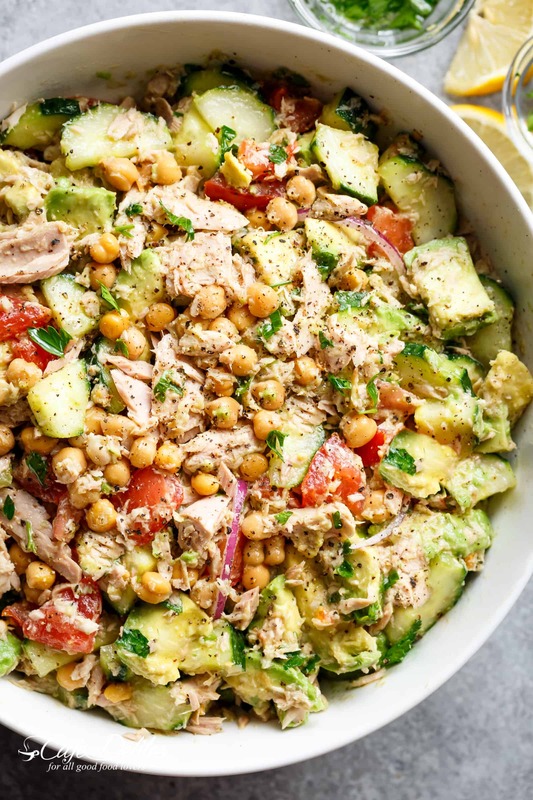 “Healthy and filling, this Tuna Salad is not only packed with amazing flavours, it is ALSO a bowl full of protein, fibre and healthy fats! Have it for lunch or dinner, as a side or main dish, this tuna salad is especially perfect in hunger emergencies.” Recipe: CafeDelites. 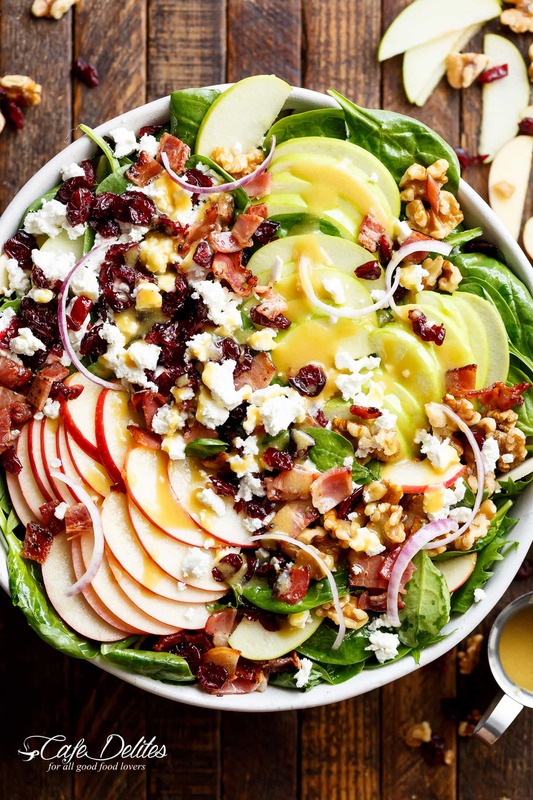 “Honey Dijon Apple Bacon Cranberry Salad screams FALL! Cranberries, Spinach, Walnuts And BACON! 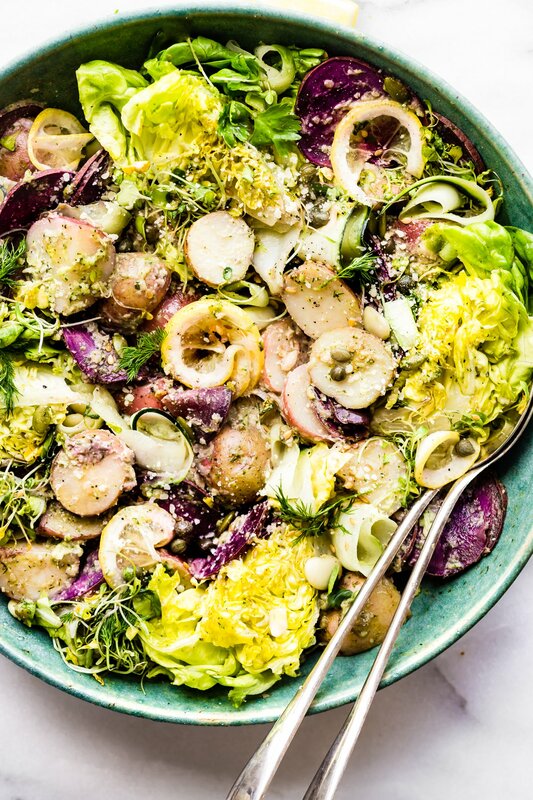 All drizzled with the most perfect Honey Dijon Dressing!” Recipe: CafeDelites. 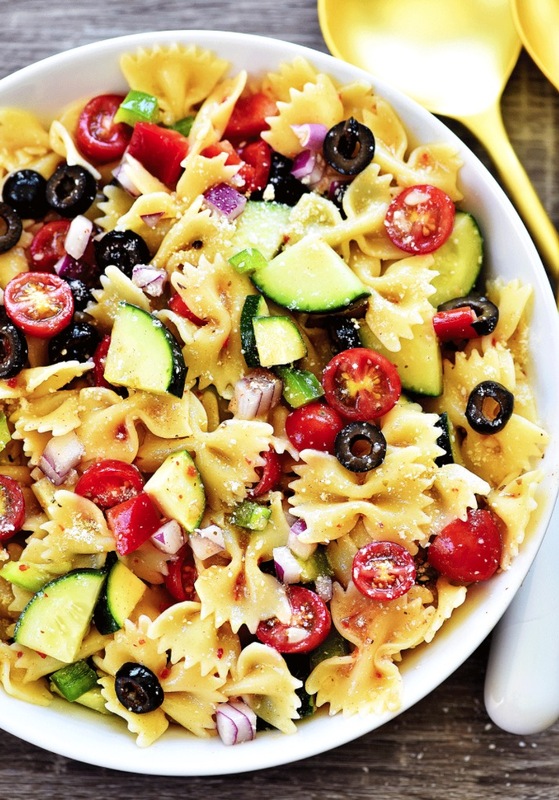 “This CALIFORNIA PASTA SALAD is a great example. No oven required for this AMAZING salad. 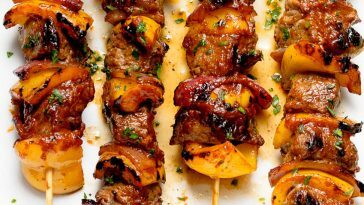 I served it at a small barbecue we had Saturday night and it was a hit. It is fresh, healthy and packed with flavor. 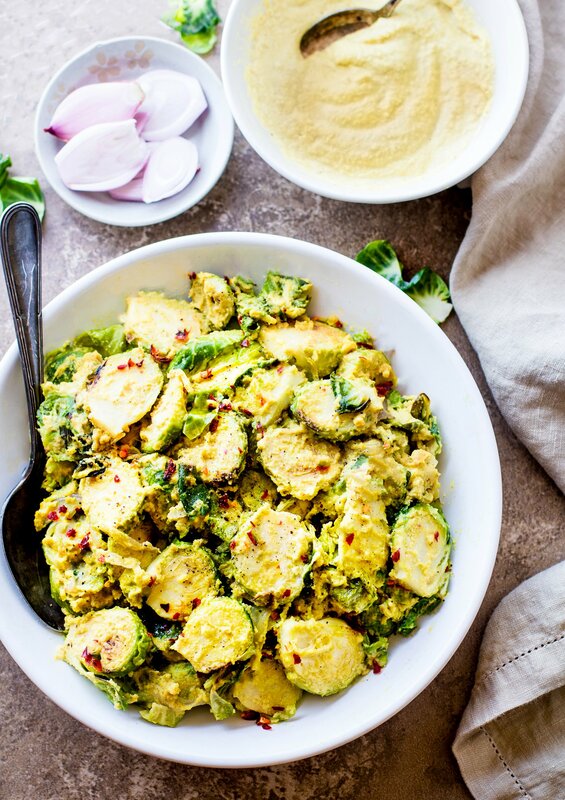 All of my favorite veggies are inside this delicious bowl of yum.” Recipe: LifeInTheLoftHouse. “This delicious spinach bacon salad recipe is brimming with crunchy cheddar cheese crisps, crisp spinach, juicy tomatoes, and smoky bacon dijon dressing.” Recipe: WholesomeYum. “This Tex-Mex salad contains lots of yummy things. Crunchy romaine lettuce, corn, black beans, tomatoes, green onion and of course grilled chicken. I like to cook up small bite-size pieces of chicken seasoned with just salt and pepper. Then throw them in at the very last while they’re still a little warm. Then I toss it all together with the heavenly taco-flavored ranch dressing.” Recipe: LifeInTheLoftHouse. “This easy low carb Big Mac salad recipe is ready in just 20 minutes! 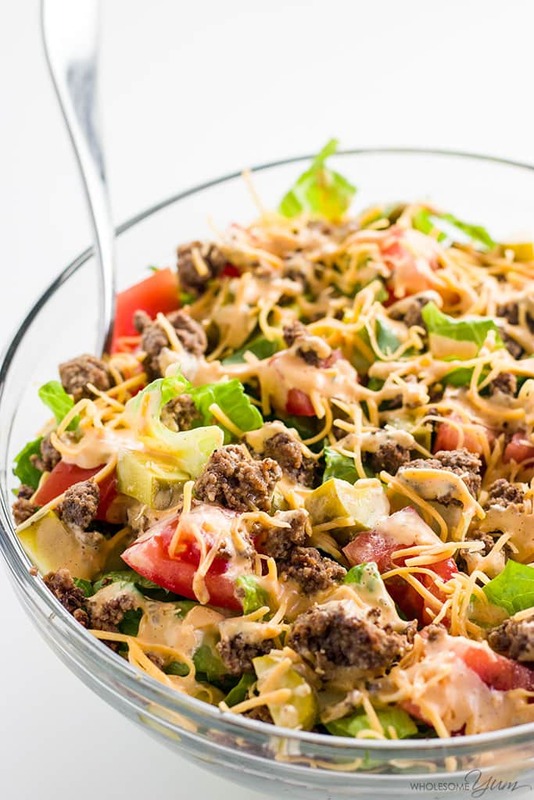 A gluten-free, keto cheeseburger salad like this makes a healthy lunch or dinner.” Recipe: WholesomeYum. 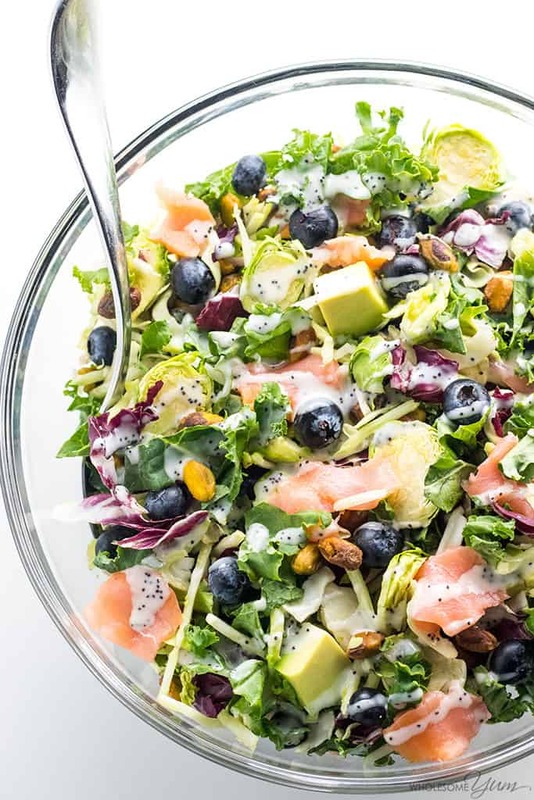 “Easy sweet kale superfood salad with lemon vinaigrette, smoked salmon and avocado is like a better Costco kale salad. 5 ingredients, plus 5 in the dressing!” Recipe: WholesomeYum. 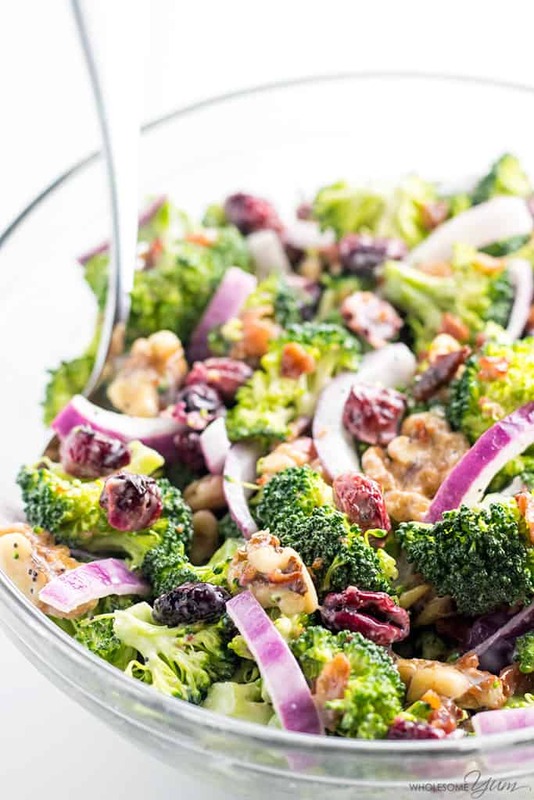 “Even if you know how to make broccoli salad with bacon, this broccoli cranberry salad recipe is a must-try. It has the best broccoli salad dressing!” Recipe: WholesomeYum. 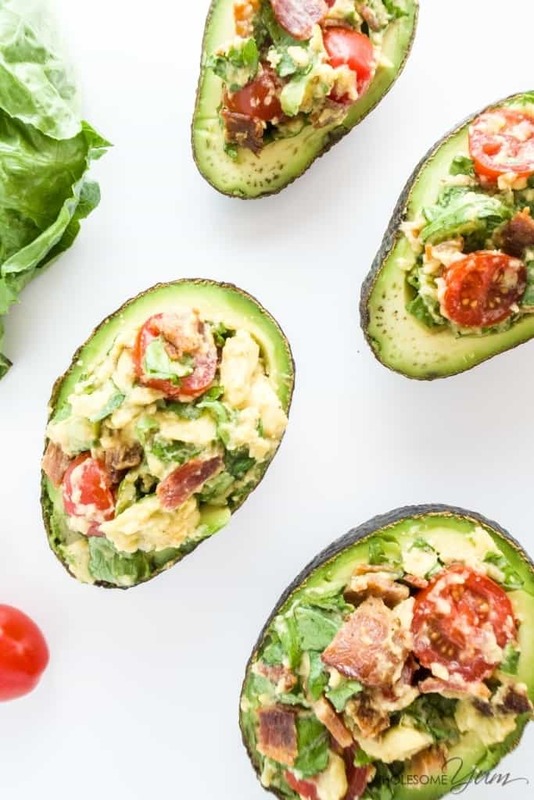 “This BLT stuffed avocado recipe makes a perfect lunch or snack. 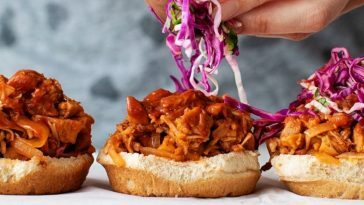 It’s naturally healthy, low carb, paleo, and gluten-free.” Recipe: WholesomeYum. 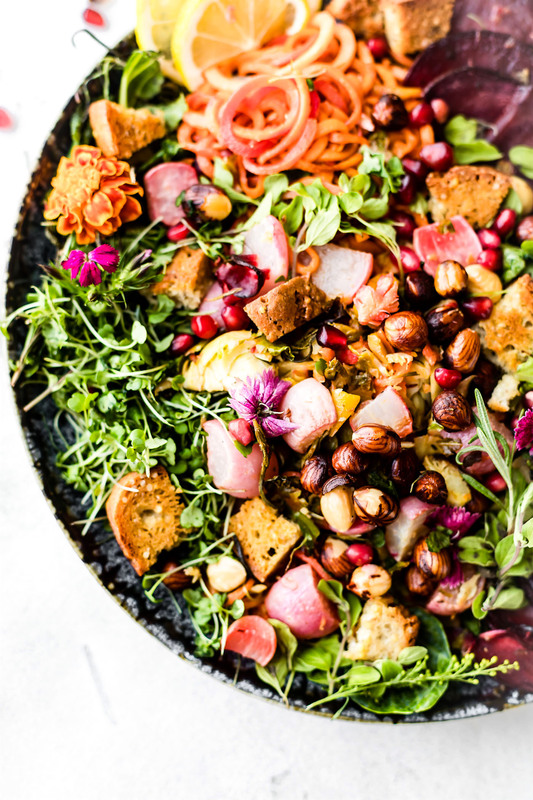 “This Roasted Vegetable Panzanella Fall Salad is the perfect Autumn dish to keep you nourished all season. Herb roasted Fall Vegetables, leafy greens, gluten free ancient grain bread, pomegranate, and toasted hazelnuts. It’s a wholesome Fall salad you’ll want to make again and again. Dairy free, simple to make.” Recipe: CotterCrunch. “Okay, now we need to talk about this salad. 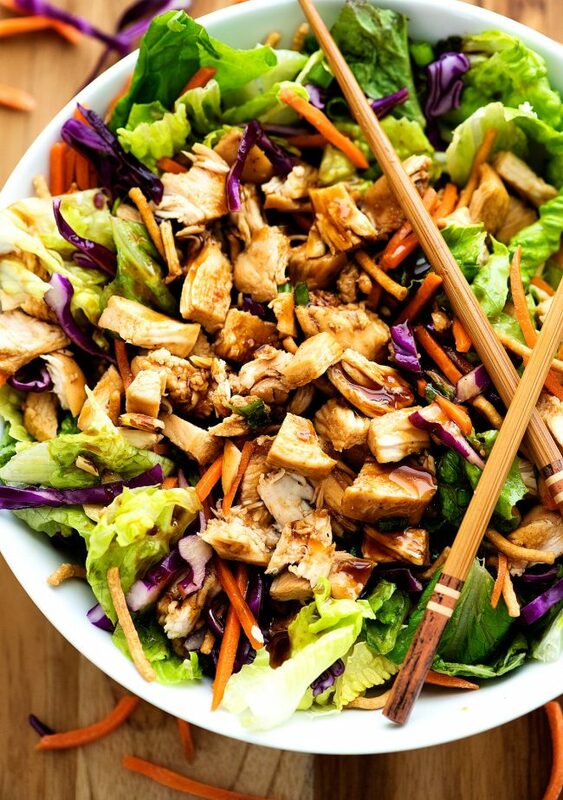 This CHINESE CHICKEN SALAD! I made this for dinner a few days before my surgery and we just loved it. Shredded carrots, green onion, red cabbage over a bed of romaine lettuce. Then you top it with the most delicious chicken and Chinese dressing. Yummers. It has so much flavor in every bite!” Recipe: LifeInTheLoftHouse. 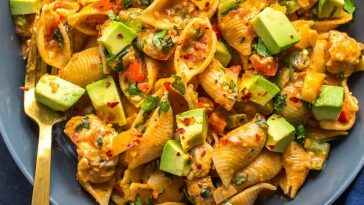 “Bruschetta chicken pasta salad is a must make for any occasion! 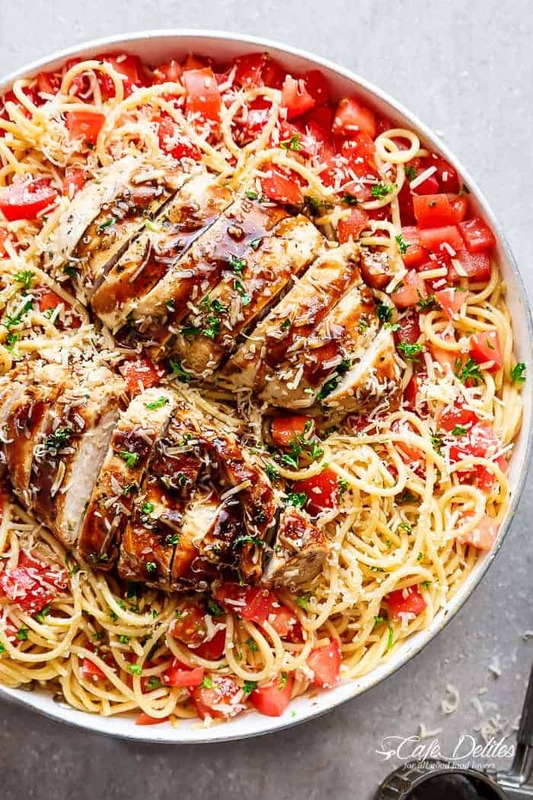 with italian seasoned grilled chicken and a good kick of garlic and parmesan cheese, this is one pasta salad that will impress!” Recipe: CafeDelites. 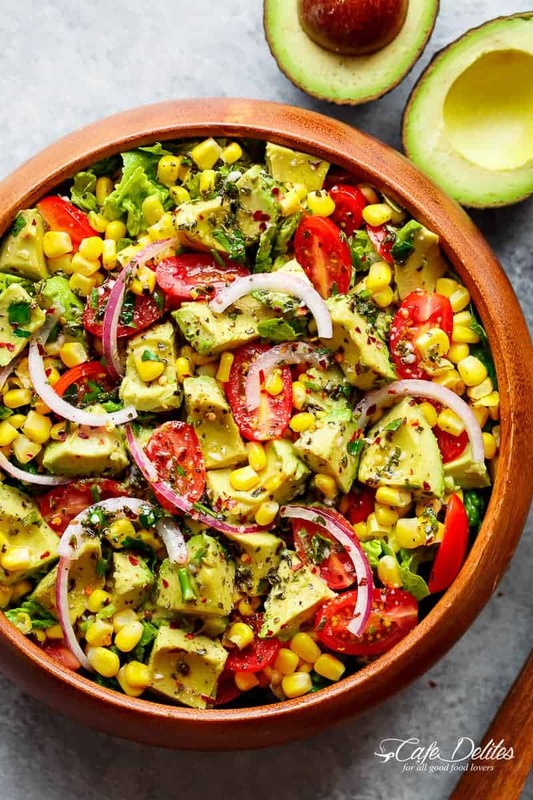 “Avocado corn tomato salad with a lime juice dressing is delicious served on its own, or as a side that easily pairs with anything on your plate!” Recipe: CafeDelites. 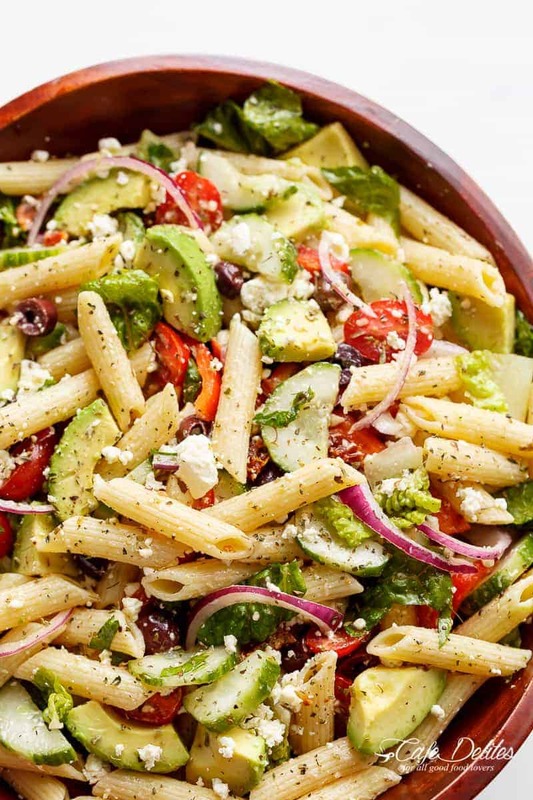 “Lemon herb mediterranean pasta salad is loaded with fresh mediterranean inspired salad ingredients, and drizzled with an incredible lemon herb dressing!” Recipe: CafeDelites. “Chicken Caesar salad is hands down one of the most popular and loved salads around the world. So is a good Cobb salad. Merging two into one? EVEN BETTER! 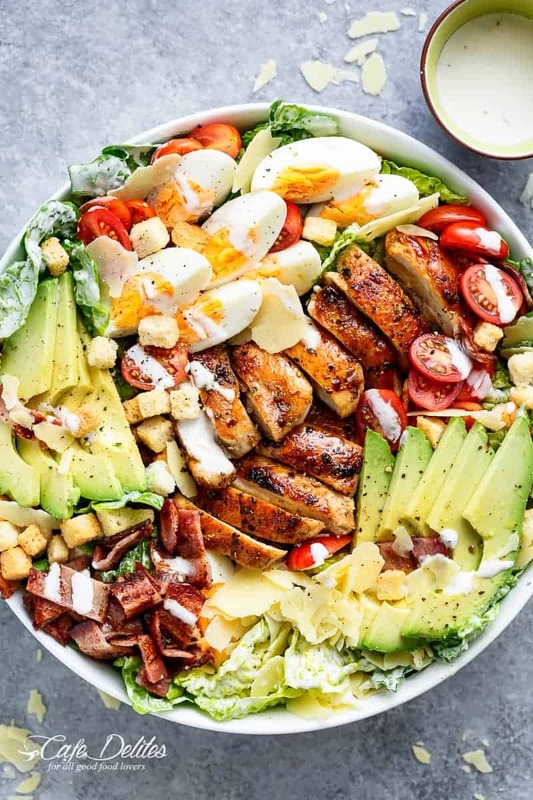 Grilled Chicken Cobb Caesar Salad coming at you in 10…9….8….” Recipe: CafeDelites. 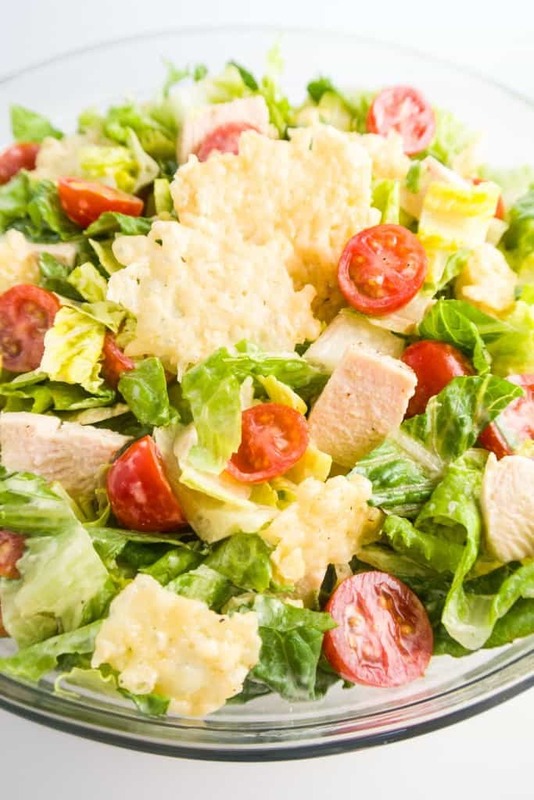 “This delicious low carb Caesar salad features crunchy parmesan crisps, chicken, and creamy homemade Caesar dressing. 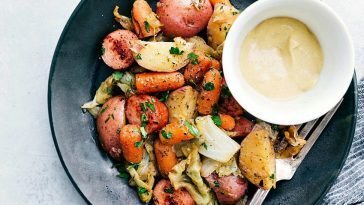 Just 10 ingredients including dressing!” Recipe: WholesomeYum. 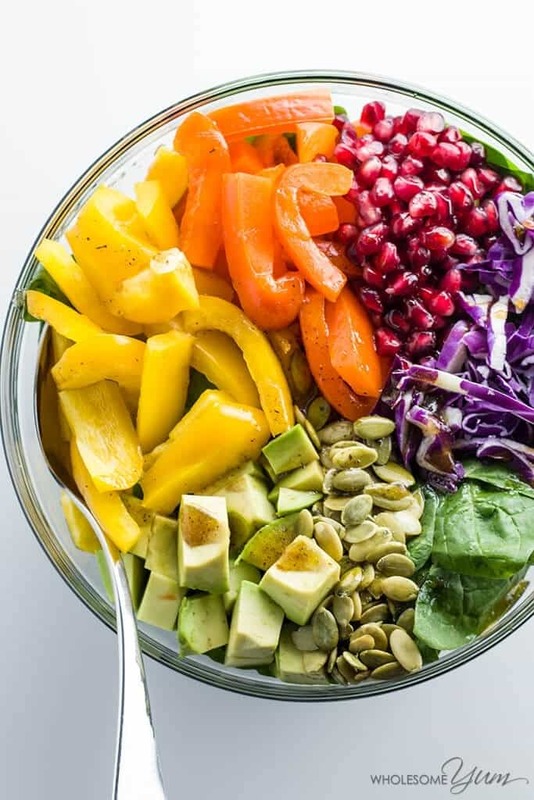 “This easy and healthy rainbow salad recipe with pomegranate vinaigrette is so quick to make. 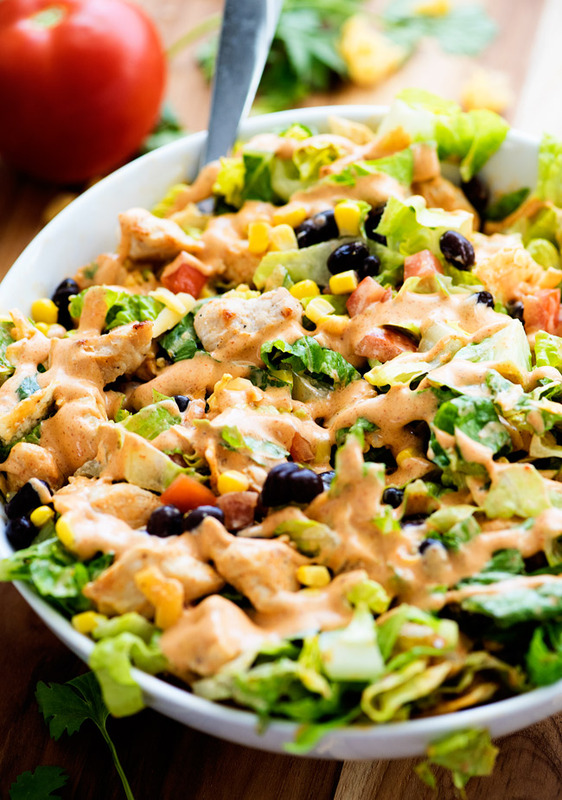 Only 10 ingredients including the dressing!” Recipe: WholesomeYum. “This is not just any salad. well, definitely not for the faint hearted. 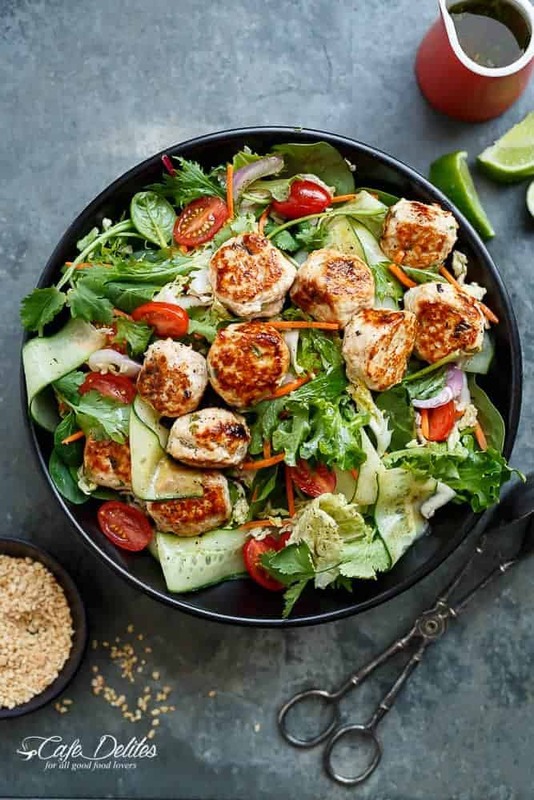 a thai chicken meatball salad full of thai-inspired flavours, both healthy and filling and perfect for lunch or dinner.” Recipe: CafeDelites. 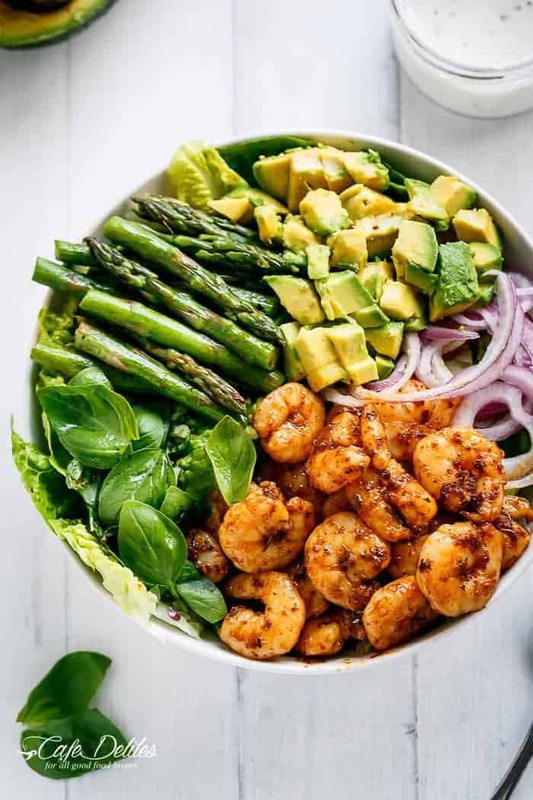 “Blackened shrimp, asparagus and avocado salad with lemon pepper yogurt dressing. This is the perfect salad done in less than 10 minutes! 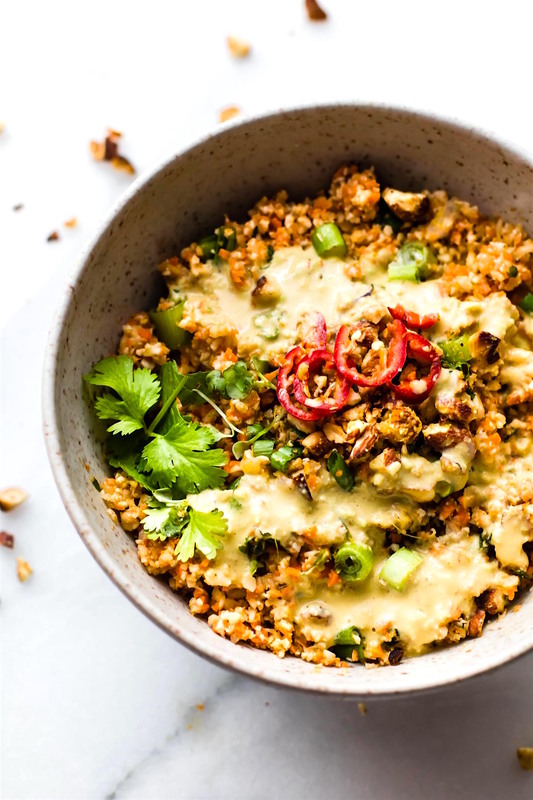 Low fat AND low in carbs, but full of creamy, spicy flavours!” Recipe: CafeDelites. “Loaded Leftover Turkey Nachos Salad Bowls! 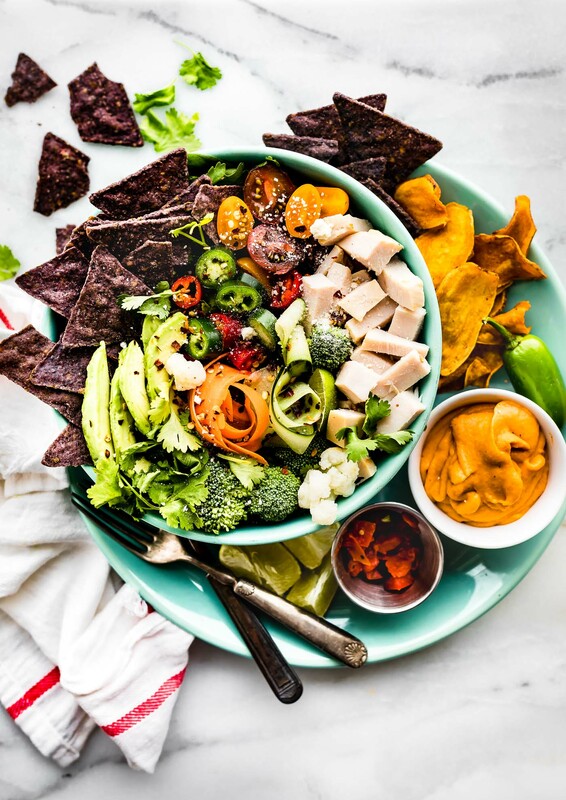 Put those leftovers to use with a healthy leftover Turkey Nachos Salad recipe. Loaded with roasted turkey, jalapeños, seasonal vegetables like sweet potatoes, blue corn tortilla chips, and a dairy free friendly salsa con queso topping! 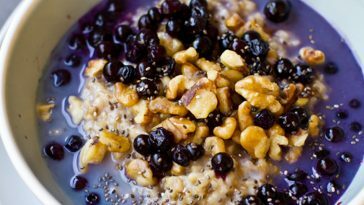 Wholesome, easy to make, and delicious!” Recipe: CotterCrunch. “Spicy shrimp Caesar Spinach salad is a quick light meal for lunch or dinner! 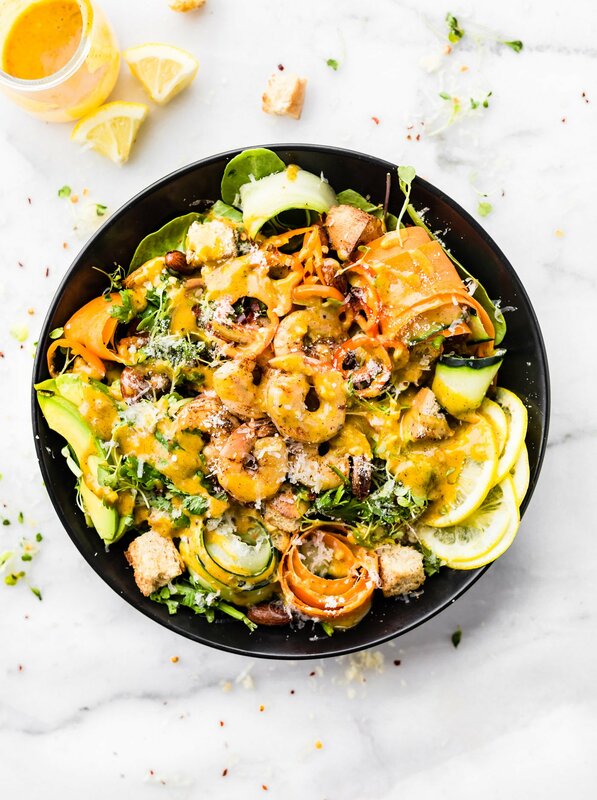 The spicy shrimp and kickin’ homemade Caesar dressing is key to making this salad shine! Tender shrimp tossed in chile powder, onion, and cayenne then baked crispy! A flavorful and healthy Protein-Rich Salad! Paleo option if needed!” Recipe: CotterCrunch. 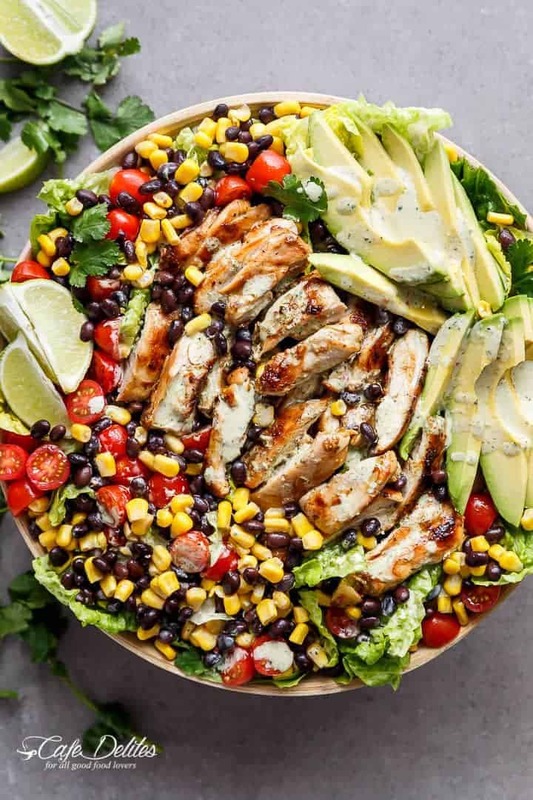 “Put a spin on a southwestern salad with this chili lime southwestern chicken salad with a low fat and creamy cilantro chili lime dressing that doubles as your marinade!” Recipe: CafeDelites. 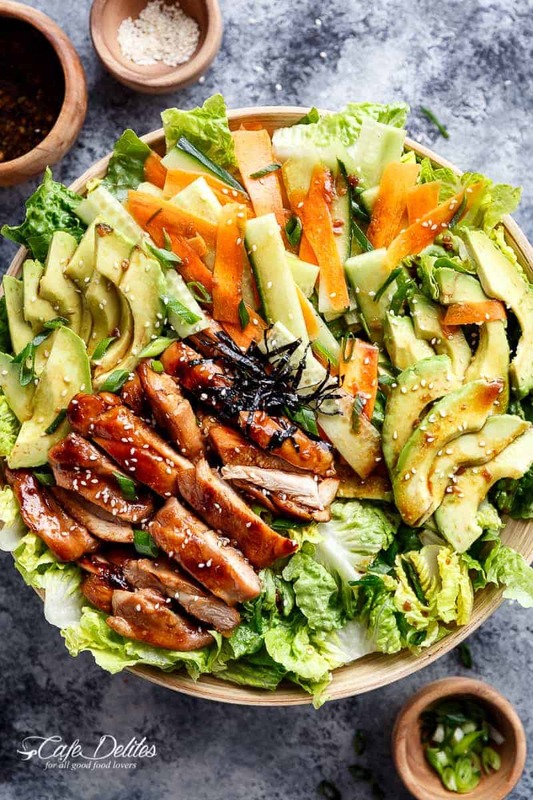 “Teriyaki glazed chicken salad complete with avocado, cucumbers and carrots for real sushi lovers! 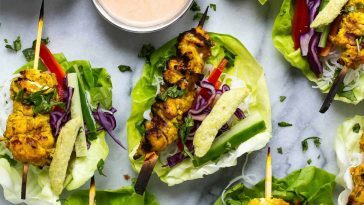 drizzled with an incredibly easy teriyaki dressing that doubles as a marinade!” Recipe: CafeDelites. 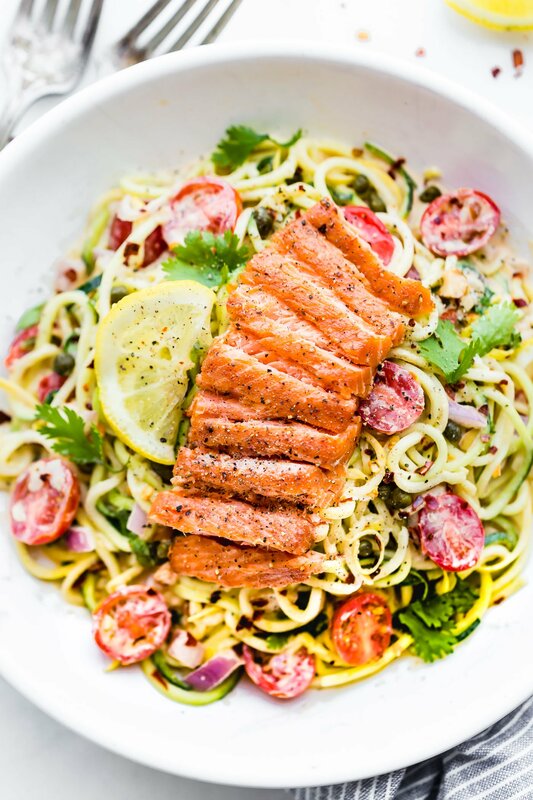 “A kickin Smoked Salmon Zucchini Noodles salad makes for a perfect no cook meal! Just what we need for Summer, yes? Or anytime really! A zippy cajun sauce tossed in chopped vegetables and zucchini noodles then topped with peppery smoked salmon. It’s TO DIE FOR! Paleo, low carb, and Real food deliciousness!” Recipe: CotterCrunch. 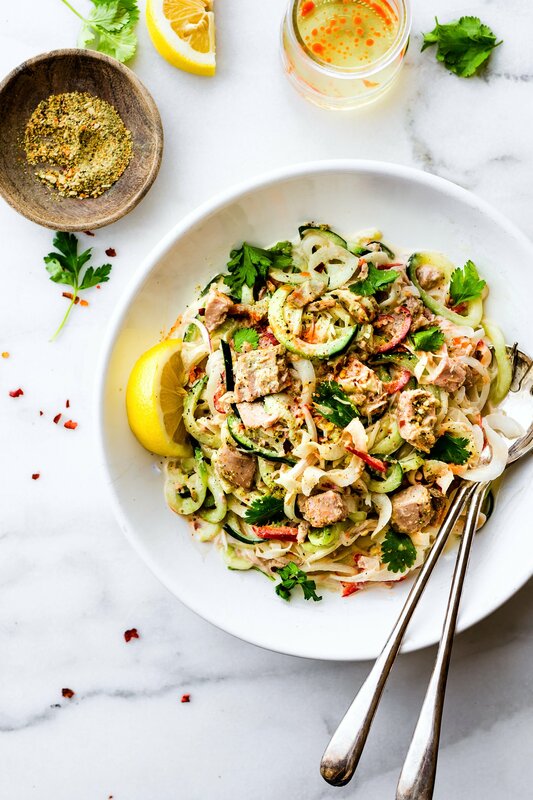 “A Paleo Spicy Tuna Spiralized Spring Vegetables Salad ready in 10 minutes! Spiralized Spring Vegetables never looked so good! Omega Rich Tuna mixed with spiralized vegetables in a chili garlic sauce. Low carb and Whole 30 friendly too. Kickin’ off the month of May easy peasy!” Recipe: CotterCrunch. “Here comes my confession: I love Caesar Salad. And what I love more than a good caesar salad, is a twist on the traditional. Remember the Skinny Chicken and Avocado Caesar Salad I shared a few months ago? Well, this is like that…but better.” Recipe: CafeDelites. 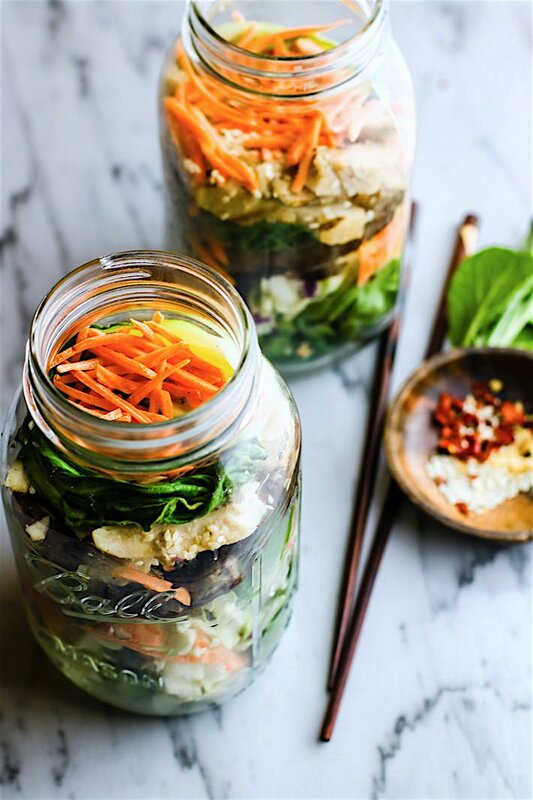 “Easy Oriental Chicken Bok Choy Mason Jar Salads! Light, Gluten Free, and Paleo friendly oriental style mason jar salads that are great for lunch or dinners on the go! Perfect use of leftover vegetables and grilled or stir fried chicken as well. Portable Healthy lunches just got easy. ” Recipe: CotterCrunch. 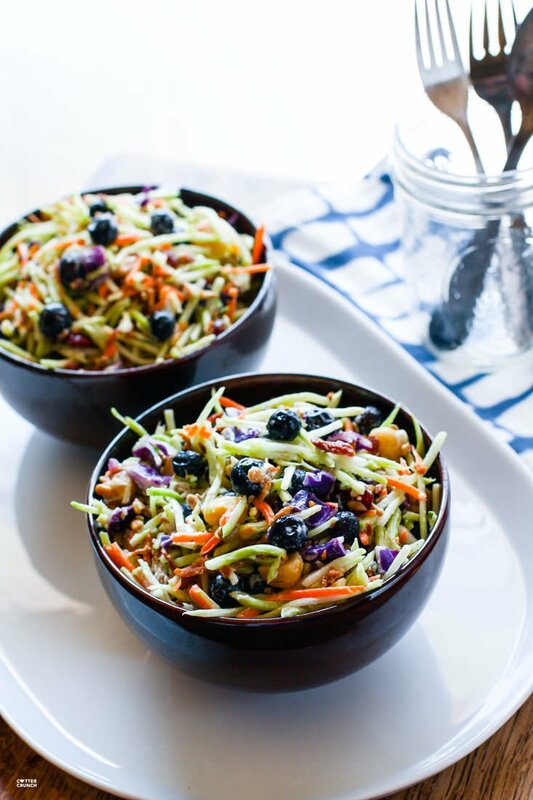 “Broccoli Slaw Salad with Blueberries is tart and creamy, and packed with antioxidants and probiotics! The tang comes from using a kefir yogurt blend; no mayo needed! Which also makes it healthy and gut friendly. 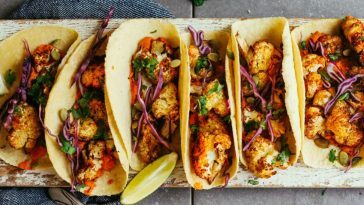 Super clean eating recipe with great flavor! ” Recipe: CotterCrunch. 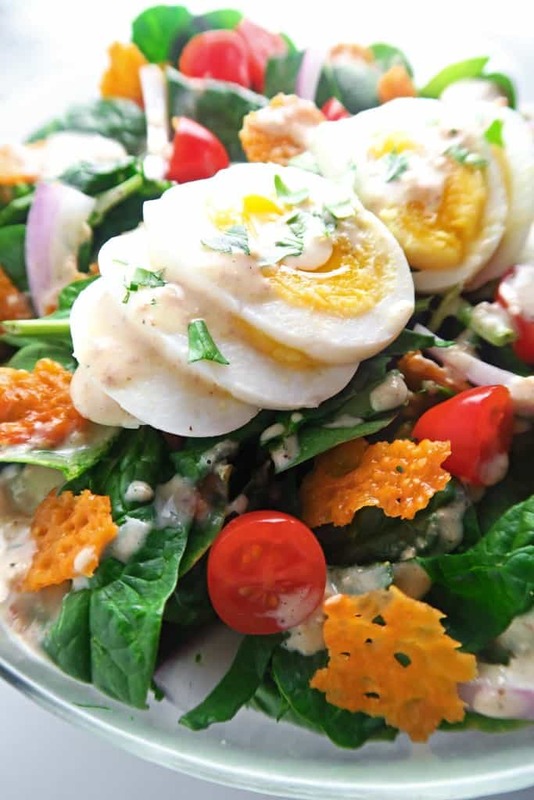 “This salad is a new favorite of mine and I believe will become yours too! Slices of apple, crispy bacon and Gorgonzola cheese are among some of the deliciousness inside. Of course the dressing always makes that final touch and this Sweet Balsamic Vinaigrette does just that.” Recipe: LifeInTheLoftHouse. 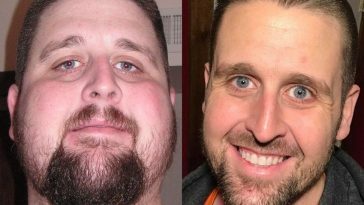 Previous article Find Out How Depressed & Unmotivated Desiree Hunt Lost Over 100 Pounds In A Year! Next article Learn Exactly How Sophie Austin Lost 40 Pounds & Completely Transformed Her Body!